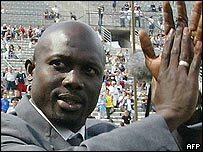 The Liberian football hero George Weah has been given the go-ahead to contest the country's presidency. Liberia's election commission dismissed a complaint that his alleged French citizenship barred him from standing. Mr Weah, 38, who is considered one of the favourites in the presidential race, welcomed the decision. On Saturday the election commission published a list of 22 candidates cleared to run in the poll, which is due to take place in October. Voters will be asked to choose a successor to the transitional president, Gyude Bryant, who took office in October 2003, succeeding Charles Taylor, after Liberia's 14-year civil war. Six of the original 28 applicants were rejected by the election commission. But a complaint against Mr Weah, lodged by rivals, was thrown out. The former soccer star, voted world footballer of the year in 1995, has been accused of adopting French citizenship while playing for Paris St Germain in 1993. Earlier this month Mr Weah's political party, the Congress for Democratic Change, elected him to lead the party in the poll. "I am happy about the decision taken by the [commission] because those people who brought this case against me did not know what they were talking about," Mr Weah told Reuters news agency. 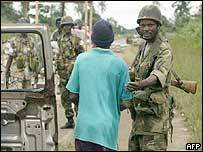 "But what we need here in Liberia is peace. We at the CDC are very happy with the ruling and we hope that they will continue their good work." Election campaigning gets under way on Monday. Among the others running for president are Ellen Sirleaf of the Unity Party, who opposed former Liberian strongman Charles Taylor in the 1997 vote, and Sekou Conneh, the head of the Lurd rebels who invaded Monrovia, leading Mr Taylor to flee into exile in August 2003. In concurrent legislative elections 206 candidates are fighting for 30 Senate seats, and the 64 lower house seats are being contested by 503 hopefuls.